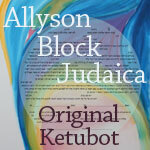 Allyson Block Judaica features original, contemporary abstract Ketubot by visual artist, Allyson Block. The site also features colorful, fun children�s Hebrew name prints based around Jewish themes and Bible stories. Get more for your wedding! Don't forget to mention ChossonKallah.com when visiting Allyson Block Judaica.